Kuala Lumpur is known for its many fantastic shopping options. Street markets, night markets, heaving department stores and glittery, product-filled malls dot all sections of the city, as they invite tourists as well as locals to shop till they drop. Many of these shopping locales around KL are in fact, owned and operated by corporate groups, one such group, which is involved in the Malaysian retail scene in a big way is the Aeon group. The Aeon group Malaysia, is a subsidiary of Aeon International (Japan) and it currently operates a chain of general merchandise stores in various parts of the country. One such shopping center operated by Aeon, is Alpha Angle, a mid-range shopping center situated in the Kuala Lumpur suburb; Wanga Maju located in the northern half of the city. Easily accessible by the KL LRT system at Wangsa Maju LRT station, the recently renovated two-level, Alpha Angle shopping center offers a wide range of stores catering to every shopping need and desire. 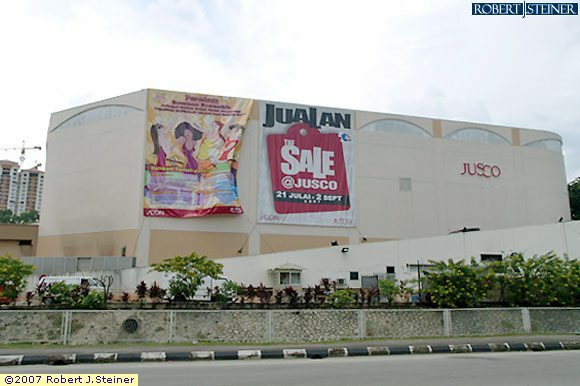 An especially popular shopping spot in the mall is the former Jusco department store and supermarket, which has recently been rebranded and brought under the Aeon umbrella. Aside from Jusco, the mall also hosts various apparel, beauty, jewelry and footwear stores belonging to several domestic and international brands like SaSa, Body Shop, Vincci, Royal Sporting House, Crocs, Camel Active, Giordano, Habib diamonds, Poh Kong jewelers and many more. To cater to the dining needs of the shopping hordes the mall is equipped with a variety of fast food and full-service restaurants like the Chicken Rice Shop, Nando’s, Papa John’s Pizza, McDonald’s, Famous Amos and many more. Alpha Angle is further equipped with specialty gift shops, pharmacies and also hosts outlets offering banking, florists, beauty salon, money changing, shoe repair and photograph processing services. Also onsite are stores retailing technology and electrical equipment, bookstores, fitness equipment stores and music and entertainment stores. In short, Alpha Angle with its wide range of stores and services aims to be a one-stop shop for all your shopping needs. So if you are at all curious to see how local Malaysians shop come to Alpha Angle at Wangsa Maju to discover for yourself.